Commencement held at Ohio Northern University. Parsons Corporation Federal Business Unit President Carey Smith was the speaker at ONU’s undergraduate commencement ceremony Sunday. 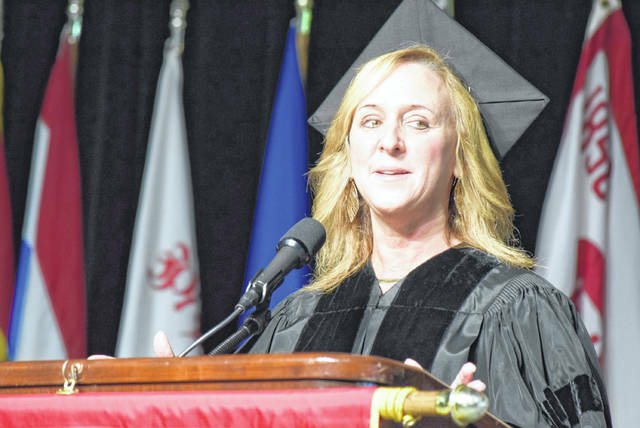 ADA — “Explore.” That’s the message Carey Smith had for graduates at Ohio Northern University’s 147th-year commencement Sunday at the ONU Fieldhouse. “Explore unfamiliar areas, things outside of your comfort zone, because once you do that you’ll just find what you’re very passionate about in life,” she said. Smith graduated from ONU in 1985 with a Bachelor of Science degree in Electrical Engineering. She went on to get a Master of Science degree at Syracuse University. She’s worked for three different companies throughout her 33-year career, all in the aerospace and defense industry. She is currently president of the federal business unit at Parsons Corporation, a leading defense, security, engineering, and infrastructure firm. “I have a philosophy of working very hard, working very smart, setting goals for myself — short, mid, and long-term goals — being very bold, being very decisive. At the end of the day in this field I’m in, because we’re national security-focused, it’s all about delivering in the customer’s mission. So if you stay focused on what’s important to your customer, then you will succeed,” she said. Since graduating from ONU in 1985, she’s only been here once before. “I came back two years ago to give the Spotts Lecture on cybersecurity. So that was my first time back since I graduated and this is my second visit back. The school looks the same, yet different. Some of the old things I was used to, like the station house and women-only dorms and things like that have changed, but the campus, in general, looks pretty much the same,” she said. On what else she would tell students: “I would say probably the big thing is to make sure that you focus on not just a career but a very solid work-life balance. I think family is very important. I’m fortunate. I’ve been married to my husband for 30 years and we have three children who are all doing excellent in their own areas, so I would say just they’re both equally important. Always remember that,” she added. Smith, along with Alfred E. Cohoe and Terry D. Keiser, received honorary degrees in ceremonies Sunday. https://www.limaohio.com/wp-content/uploads/sites/54/2018/05/web1_ONU-Commencement-toned.jpgParsons Corporation Federal Business Unit President Carey Smith was the speaker at ONU’s undergraduate commencement ceremony Sunday.